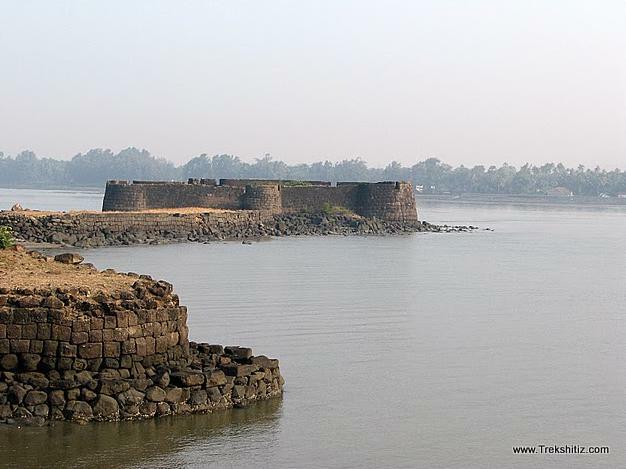 The shoreline of Alibaug comprises of two joint forts viz; Kolaba and Sarjekot. These forts come under the category of Mixed forts as they turn into land forts at the time of low tide and are easily accessible by walking and sea forts when it is high tide. It has been traced from one of the edicts of Shivaji Maharaj that he had ordered to build a fort on the shore and if required flatten the hilly terrain or build the fort on top of it. The main aim was to arrest the permeability of the area from enemies. It is suspected that Sambhaji maharaj built the fort on the rock adjoining the Kolaba fort taking into consideration the above edict. Marathas built a fort on Khanderi island in the sea of Alibaug and left the island of Undheri unused. In 1671, the Siddi of Janjira captured Undheri and built a fort on it which proved to be a smart move against the Marathas. Sambhaji Maharaj might have deduced the same danger for Kolaba and Sarjekot forts and decided to build a causeway to join them. This small brother of Kolaba fort is just 26 meters X 27 meters in size and has 5 bastions and a fortified wall. The main doorway faces Kolaba fort towards northwest. Stairs in the fort takes us to the brink. There is a dried up well inside and is covered in vegetation. There was supposed to be a temple of Lord Vetal inside the fort. One has to reach Alibaug via Panvel, Vadkhal from Mumbai. The fort is easily accessible from Alibaug beach during low tide. Below are the timings of low tides based on lunar calendar.